Announcement We are purveyors of all natural artisan soaps, hand-crafted in very small batches using only the most deserving and essential of elements. Make no mistake, these soaps are special and deeply inspired. If you yearn for a return to simpler times, our soaps are your road back home. We are purveyors of all natural artisan soaps, hand-crafted in very small batches using only the most deserving and essential of elements. Make no mistake, these soaps are special and deeply inspired. If you yearn for a return to simpler times, our soaps are your road back home. 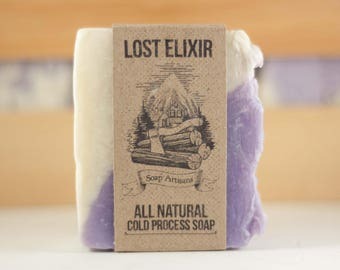 This is my favorite soap on Etsy! Very high quality, repeat customer. Lavender and Rosemary - back in stock! Activated Charcoal right before cutting into individual bars. Lemon and Tea Tree essential oils with Bentonite and White Kaolin clays and Shea Butter make this recipe a customer favorite! Why Soap? What's Your Inspiration? I’m often asked what it is that started me down the path of making soap. To which, I usually admit, I’m not entirely sure. I love learning new skills, particularly those skills that are often considered “old world” or “homesteading” in nature. To me, I’ve always loved the idea of “the renaissance man”, where by life experience, strength of will, and a stubborn unwillingness to give up – you can pretty much do anything you set your mind to. So it was within this mental landscape, that I started teaching myself to make handmade soap. When I started out, I went through many failed experiments and disappointing results – and then graduated to the point where it was “technically soap” – but nothing to write home about. And I remember thinking, “there’s no way this is where I move on to something else – I must do better”. And so I did…, yet somewhere along the way, I seem to have become unknowingly obsessed with the quest for crafting the “perfect bar of soap”. And even today, where years later, my recipes are pretty battle-hardened, and my customers are pretty stoked… yet still, the quest continues. I’m always improving in the most incremental of ways, nuances and nudges towards that ever-moving goal of the perfect bar. 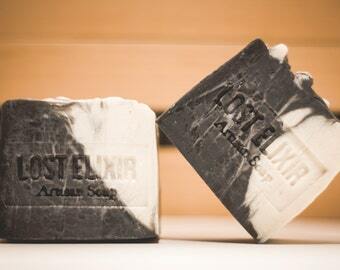 All my soaps are 100% all natural, made by hand, by me, and me alone – nobody else formulates or crafts my soap, I alone make and package every single batch of Lost Elixir Artisan soap – as in the end, each bar is a reflection of me, and that which inspires me. That which most inspires me, is nature itself. Our lives are filled with an unending stream of pressures and stresses - from deadlines to meetings and emails - to picking the kids up from school and getting them later after soccer practice. It's a lot - and it's chaotic. But there is a simpler place, where the brooks babble in the distance, and the birds and crickets fill our ears with nature's enchanting verse. That lost haven is the old forest, where the pines and maples are all that separates us from the infinite wonders of the stars above. When we go to this place, we exchange the asphalt sidewalks for pine needle laden pathways and we let our mind and body acclimate to the natural state of the world around us - we become an extension of the peace and energy of the forest. We fill our lungs with crisp mountain air and become fully aware and alert to the experience of now - all worries and concerns become muted, and ultimately fall away. The place I've just described, is the place I feel most alive, it's the place I go to get away, it's the inspiration for my deepest and most beloved creative energies - it is the energy and inspiration behind all the soaps I make. I love the idea of simpler times, and I believe that by channeling the beauty and enchantment of the mountains and the forest, I can create a channel for others to experience a piece of that fleeting world. It is fleeting, but sometimes all we need is a reminder, a glimpse - a feeling, a connection. And my soap, I believe, can do that. Hence the name Lost Elixir. A little bit of magic can go a long way in helping us find our way back home. For me, soapmaking is a way to hold on to the enchantment of nature. Simpler times may seem lost, but I've discovered that through soap, there is always a way back home.